Geneva Opal Kirkman, daughter of William M. Kirkman and Viola Nancy Arnold, was born June 5, 1919 in Ellston, Ringgold Co., Iowa and died July 2, 1994 in Council Bluffs, Pottawattamie Co., Iowa. She married 1) Earnest Raymond Quinn July 5, 1942 at Grant City, Worth Co., Missouri and 2) Harold William Howell Nov. 17, 1986 at Reno, Washoe Co., Nevada. Earnest Raymond Quinn was born Jan. 7, 1896 southwest of Lenox, Taylor Co., Iowa, son of James Quinn and Catherine Geiger, and died April 25, 1969 in Corning, Adams Co., Iowa. 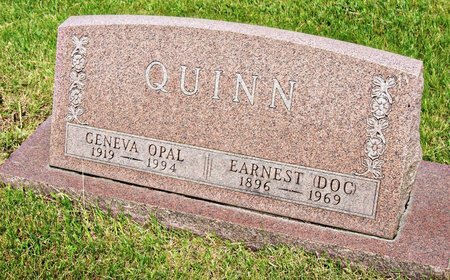 Searching for GENEVA OPAL KIRKMAN QUINN in Taylor County Iowa?